There are Numerous softwares available that exclusively deal with Autorun.inf and other Autorun viruses, for example ‘USB Disk Security‘. But Inspite of installing such kind of software, Sometimes you might accidentally open your USB disk Drive (Pen-drive) without looking at the warning by your Antivirus Software and thus Affecting your System with Autorun.inf virus. Once Autorun.inf gets control on your System, it will repeatedly Block any USB Scanning Software preventing it from deleting. It also Restricts you from opening hard drives on a double click. In such cases, the Traditional Method of deleting Suspicious Programs Using Command Prompt is quite Useful. Open command prompt. Go to start > Run, and type “cmd” . Press enter. Type “cd\” and press enter to get to the root directory of your System. Type “attrib -h -r -s autorun.inf” and press enter. 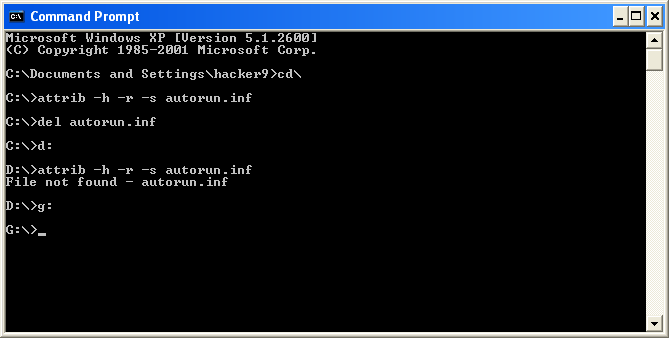 This will look for autorun.inf in the selected Drive. Type “del autorun.inf” and press enter. This will delete autorun.inf virus from the selected Drive. Repeat the above Steps for other drives. To navigate to other Drives, First type “cls” to clear your ‘command prompt’ then type “d:” . Repeat the Steps for all the Drives including your USB Disk Drive.